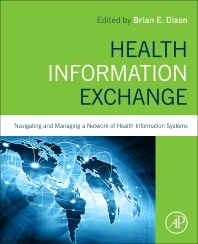 Health Information Exchange (HIE): Navigating and Managing a Network of Health Information Systems allows health professionals to appropriately access, and securely share, patients’ vital medical information electronically, thus improving the speed, quality, safety, and cost of patient care. The book presents foundational knowledge on HIE, covering the broad areas of technology, governance, and policy, providing a concise, yet in-depth, look at HIE that can be used as a teaching tool for universities, healthcare organizations with a training component, certification institutions, and as a tool for self-study for independent learners who want to know more about HIE when studying for certification exams. In addition, it not only provides coverage of the technical, policy, and organizational aspects of HIE, but also touches on HIE as a growing profession. In Part One, the book defines HIE, describing it as an emerging profession within HIT/Informatics. In Part Two, the book provides key information on the policy and governance of HIE, including stakeholder engagement, strategic planning, sustainability, etc. Part Three focuses on the technology behind HIE, defining and describing master person indexes, information infrastructure, interfacing, and messaging, etc. In Part Four, the authors discuss the value of HIE, and how to create and measure it. Finally, in Part Five, the book provides perspectives on the future of HIE, including emerging trends, unresolved challenges, etc. practitioners and clinical researchers involved in health systems development; advanced undergraduate and graduate students studying HIE as well as health IT; health care organizations and independent learners seeking to train for HIT related certifications. 1: What is Health Information Exchange? Dr. Brian Dixon is both a professor and researcher in the area of health information exchange (HIE). Since 2012, Dr. Dixon has taught a Health Information Exchange course at Indiana University in addition to other informatics-related courses. Dr. Dixon’s research focuses on improving clinical and public health decision-making through innovative processes and technologies that provide comprehensive information on patient and population health. Recent and ongoing work includes leveraging clinical and administrative data in electronic health records from an HIE to improve public health reporting processes, disability determination, surveillance activities, continuity of care for Veterans, and community health assessment activities. Before joining the faculty at Indiana University, Dr. Dixon managed research and development projects for the Regenstrief Institute and the Indiana Health Information Exchange. He also developed health information applications and systems, including tools supporting the standard clinical vocabulary LOINC®, technology supporting the automated reporting of notifiable conditions to public health agencies, and tools for querying large clinical data repositories. The editor has published over 40 articles in peer-reviewed journals, several chapters in informatics-related books and co-edited a book on the medical subspecialty of Clinical Informatics.